This course spans a critical era in American literature, beginning with antebellum and Civil War poetry, entering the 20th century, and traversing the transformative Modernist era. This course begins with the Poetry of the American Civil War and the series of major events and social movements that followed it—including Reconstruction, the Jim Crow Era, and Manifest Destiny, to name just a few. Encountering such poets as Herman Melville, Julia Ward Howe, Walt Whitman, Edward Arlington Robinson, Paul Laurence Dunbar, James Weldon Johnson, Francis Ellen Watkins Harper, Emma Lazarus and W.E.B. DuBois, we will examine the language of patriotism, pride, violence, loss, and memory inspired by the Nation’s greatest conflict. As we enter the 20th century, we will encounter Modernism, a movement that spanned the decades from the 1910s to the mid-1940s, and whose poetry marked a clear break from past traditions and past forms. We will read such poets as Robert Frost, T.S. Eliot, Marianne Moore, Langston Hughes, William Carlos Williams, Edna St. Vincent Millay, Claude McKay, Dorothy Parker, and Wallace Stevens. We will study how these poets employed the language of rejection and revolution, of making and remaking, of artistic appropriation and cultural emancipation. Traveling to the homes and workplaces of Robert Frost and Wallace Stevens; to the Poetry Foundation in Chicago, where the institution of American Modernism was born; and even exploring the River Thames in the London of Eliot’s The Waste Land, we will see the sites that witnessed—and cultivated—the rise of American Modernism. Poetry in America: From the Civil War through Modernism will be offered for the Spring 2018 semester at a special rate of $200 at all credit levels. 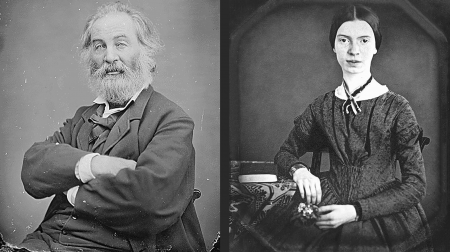 This course focuses on the poetry of Walt Whitman and Emily Dickinson, two influential and iconic American poets of the 19th century whose works gave shape to a uniquely American poetic tradition. This course will help K-12 teachers explore the intersections of literature and science-- and help their students read poems with an eye toward the natural phenomena that inspired them. Coming January 2019.